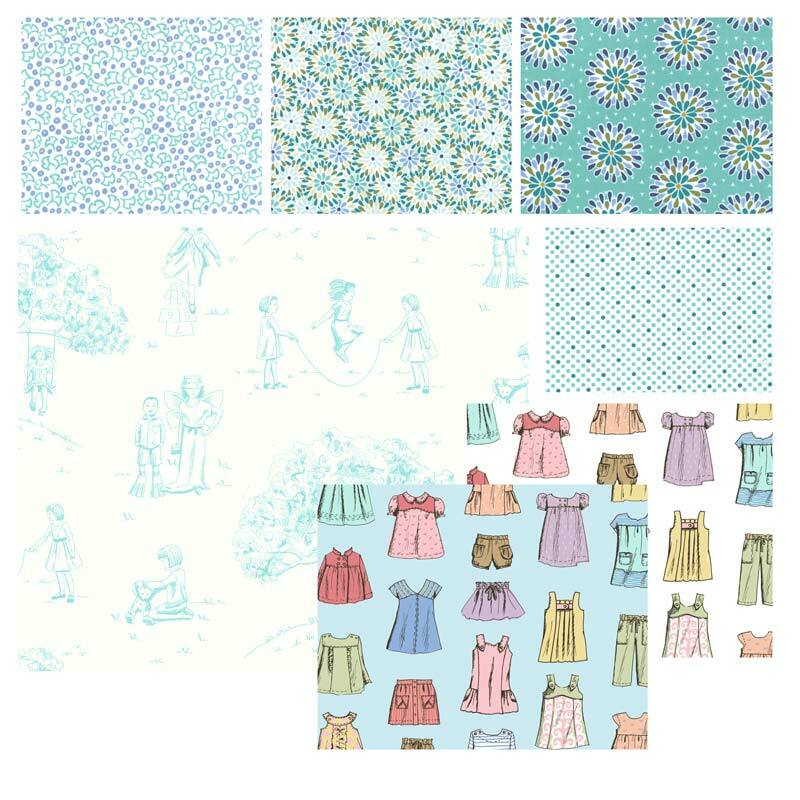 It’s finally time to introduce my newest fabric collection for Moda, Cape Ann! 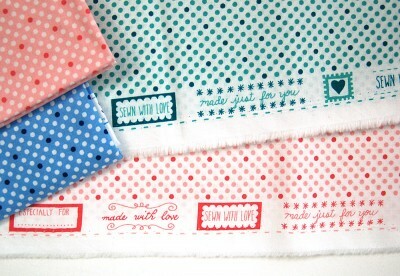 I’m very excited to share these fabrics with you. Over the past few months you may have seen images of some of the prints, especially when we released our fall sewing patterns. But now that the fabrics are shipping to stores I can give you the whole treatment. 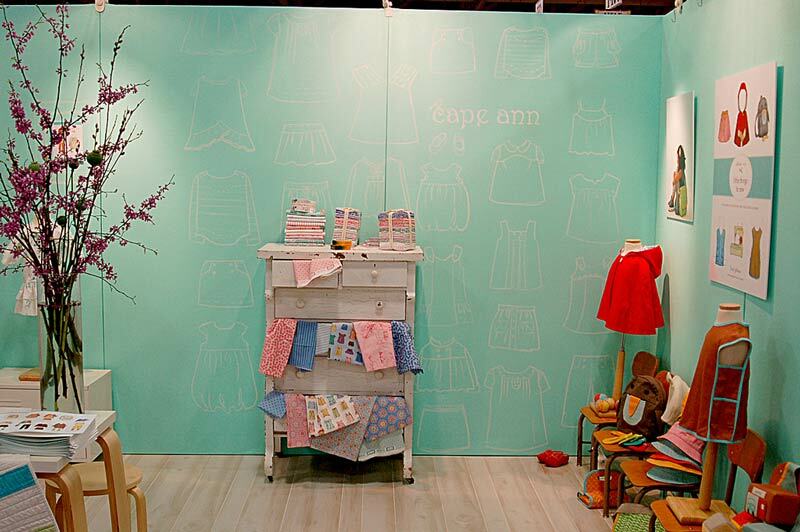 Cape Ann is inspired by the work of well-known illustrator Virginia Lee Burton. You’re probably most familiar with Ms. Burton’s work through her classic children’s books The Little House and Mike Mulligan and His Steam Shovel, which she both wrote and illustrated. While I’ve always loved these books and her illustrations, it wasn’t actually her children’s books that inspired me to create this collection. Instead, a few years ago I found an article in a magazine about the Folly Cove Designers, which was a co-operative group of artisans in the Cape Ann area of Massachusetts that was founded and led by Ms. Burton. The artists in this group worked together to create hand-printed textiles which they sold themselves. The Folly Cove Designers grew out of a renewed interest in the Arts and Crafts movement that began in England in the mid-1800s, and the group found inspiration in the environment of Cape Ann and its flora and fauna. They believed that their art should be both useful and creative. Hey wait, are you sensing a theme here? Modern Workshop, my last collection, was inspired by the Wiener Werkstatte and its emphasis on hand-crafted homewares and other objects that were both useful and beautiful. That concept of usefulness and quality seems to be striking a chord with my designs lately, hasn’t it? Must be my practical Midwest upbringing. Anyway, back to the Cape Ann collection. I love Ms. Burton’s charming textile designs and illustrative work and wanted to try something like this myself. So although I don’t think of myself as an illustrator, a few of my illustrations sneakily made their way into this collection. 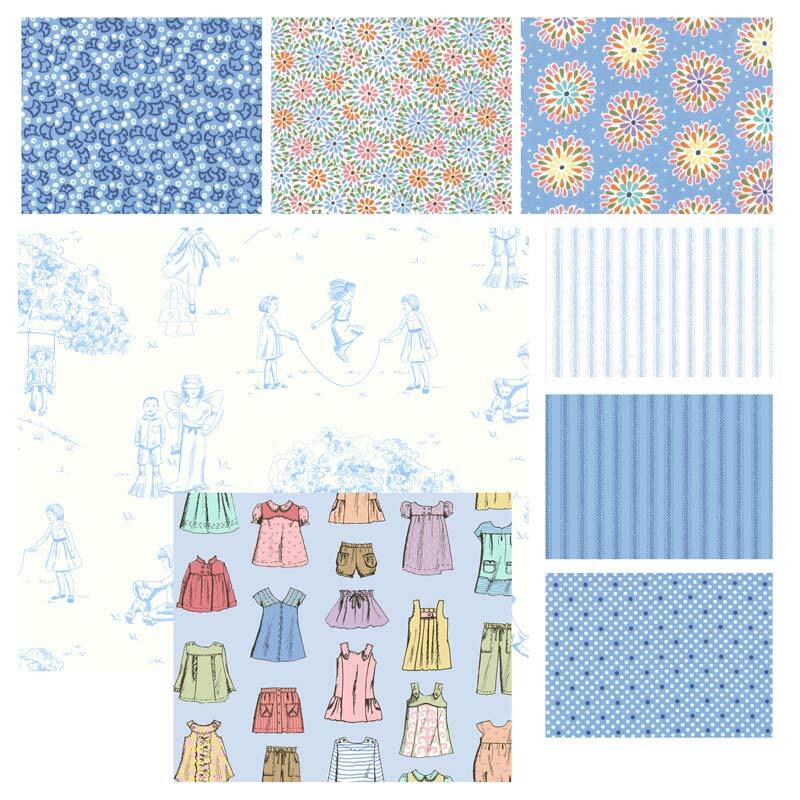 For example, this print is called Indian Summer, which is my version of a toile and features drawings of children playing. If you look closely, you’ll even see S and Bear! 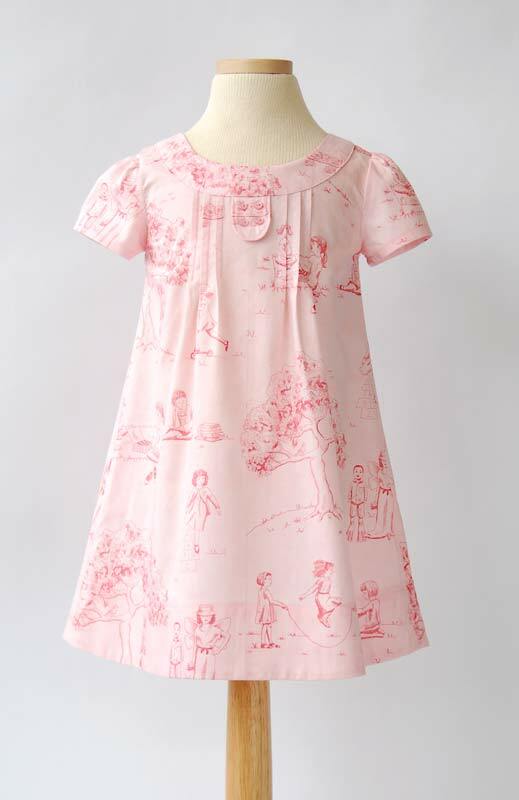 (She loves it that her favorite dress has a drawing of her on it.) 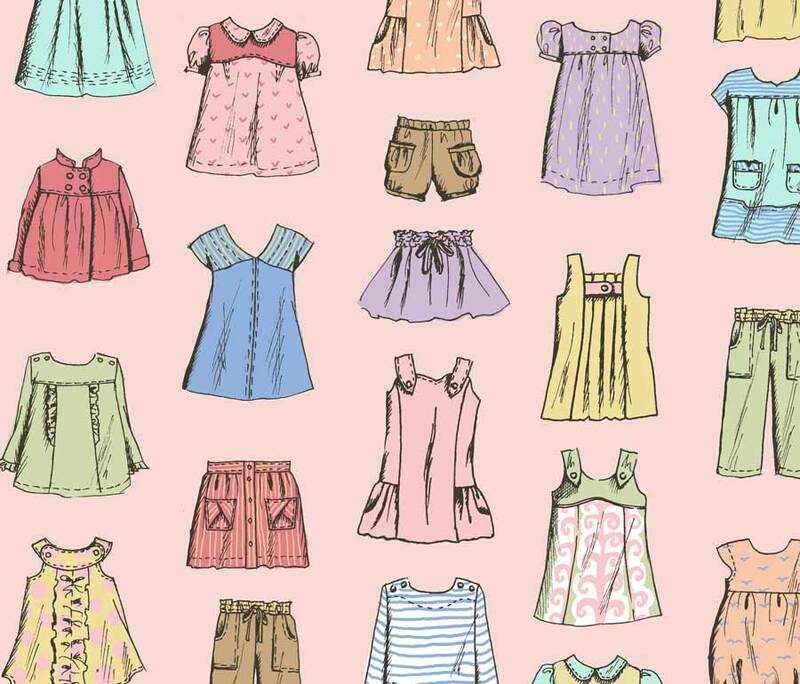 My favorite drawing in this print is the boy and girl playing dress up. He’s wearing scuba flippers and she’s got butterfly wings and an over-sized hat. 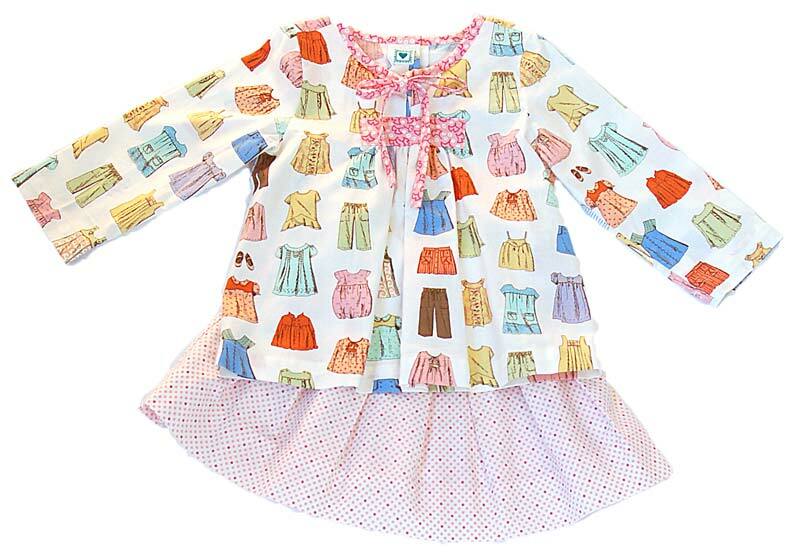 The images are sweet and a little quirky, to keep the feeling of the print a bit lighthearted. Like the Folly Cove designers, I was also inspired by a lot of the flora and fauna of our own neighborhood, right here in New York’s East Village. Last fall when I was designing this collection we walked by loads of chrysanthemums plants on our way to S’s school every day. Those autumn flowers inspired two chrysanthemum prints, Chrysanthemum Swirl and Starburst Mums. We also pass some gingko trees on our way to the library every weekend, and the fallen leaves inspired the Gingko Toss print. As far as the rest of the prints go, you know I like a good stripe. This one is reminiscent of a classic ticking stripe (but hand-drawn in this case, to give it a little charm and character). It is great for boys, too. And of course the collection includes a polka dot. I’m a sucker for polka dots. You too? I think this one turned out really fun and versatile. I added a surprise along the selvedges of the polka dots. 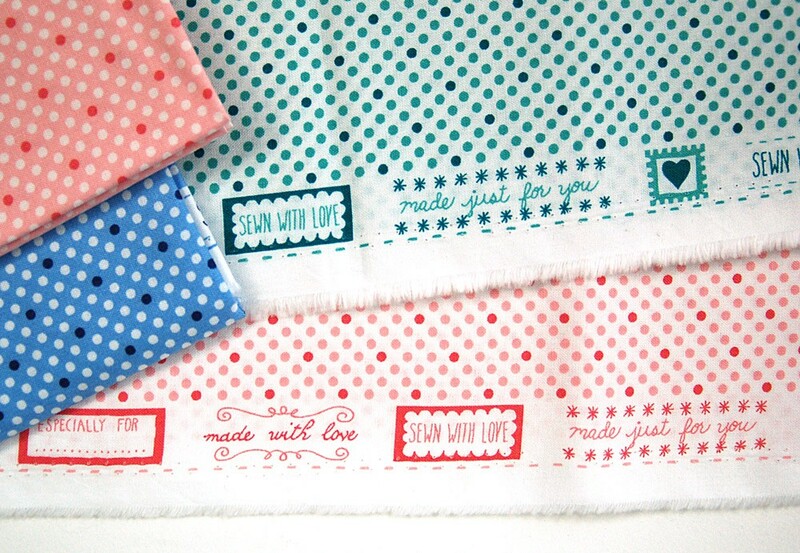 They’re little labels you can sew into your finished projects to personalize them a bit. I’ve been sewing them into samples, and they add a sweet little personalized detail to the clothing. S likes them because they’re soft and they help her to identify the back of her pants. They’d be a nice addition to anything you sew, really. The Cape Ann prints work nicely together for quilts as well as for apparel. Like the Folly Cove Designers, the fabrics are sort of a co-operative of designs, I guess? I’ll show you some quilts soon, but here are a few examples of Oliver + S patterns that combine multiple prints, just to show you what I mean. Nothing overpowering in these print combinations. Instead, they play nicely together. They’re a little like a well-behaved playdate where the parent doesn’t have to constantly intervene and can let the kids play nicely on their own. You know what I mean. 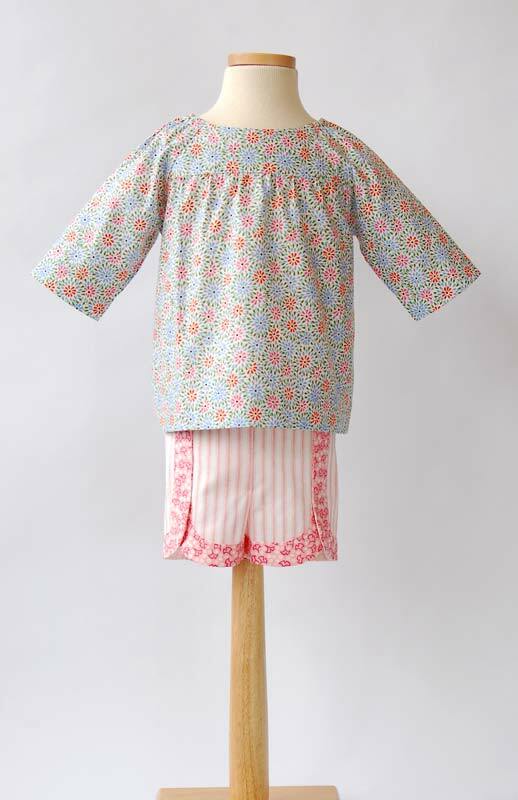 And there’s one more special aspect to this collection: all the prints are also available in a brushed cotton! This is a fabric that’s similar to flannel; it’s so soft and cozy. I think you’re really going to like it. Quilters have been telling me how much they prefer brushed cotton over flannel because it doesn’t pill and shrink like flannel. I wasn’t aware that you could tell that much of a different, but I just like it because it feels amazing. So there you have it! 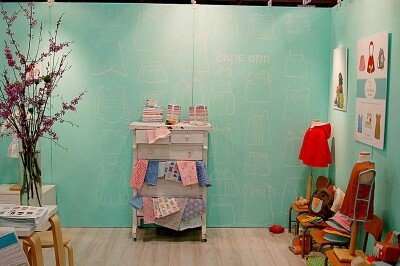 Cape Ann starts shipping this week. Of course I started a Flickr group for it, and one of these days we’ll get around to adding buttons for Flickr groups to the sidebar here so you can easily find them. I can’t wait to see what you make with these fabrics. I hope you’ll enjoy them! 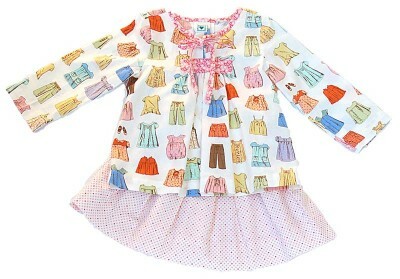 Oh, I just love the florals and polka dots! I can’t wait to find this material at the store. these look absolutely lovely and I have been waiting for these. Just a quick question–is brushed cotton something that is much thicker? I live in India where it is warm most of the year so it would be better to get the regular cotton right? Yes, the brushed flannel is thick and warm. If you live in a warm climate, you’ll want to go with the regular cotton. Wow! I have been waiting for these to come out and I am thrilled! Hopefully my local independent fabric store, Honey Run Quilters will have them. I already loved the chrysanthemum prints, but now I’m certain to get my hands on it, just for the selvedge. What an amazing idea. I’m so excited about the brushed cotton – I love working with it for cool-weather dresses. do you also have these prints available in a laminated fabric of sorts, or no? There is no laminated fabric available in this collection, sorry. I seriously can’t wait–I’ve been stalking Fat Quarter Shop all week. Can’t wait to try some of the new jammies in brushed cotton. The labels are a lovely touch. These look so amazing. I love love love the dots. Would love to get my hands on some of that brushed cotton! I LOVE this collection, my favorite is the toile. And the labels on the selvage is a wonderful idea, so typical of what I’ve come to expect from Liesl. I’m pulling out the G word for the selvege labels: GENIUS! This collection is really really beautiful. I am gasping with anticipation. Can’t wait to see them in the flesh. Kathryn, we don’t sell the Oliver + S fabric collections on our website. You could try some Google searching to find the prints you’re interested in from on-line fabric retailers who may still have them in stock. 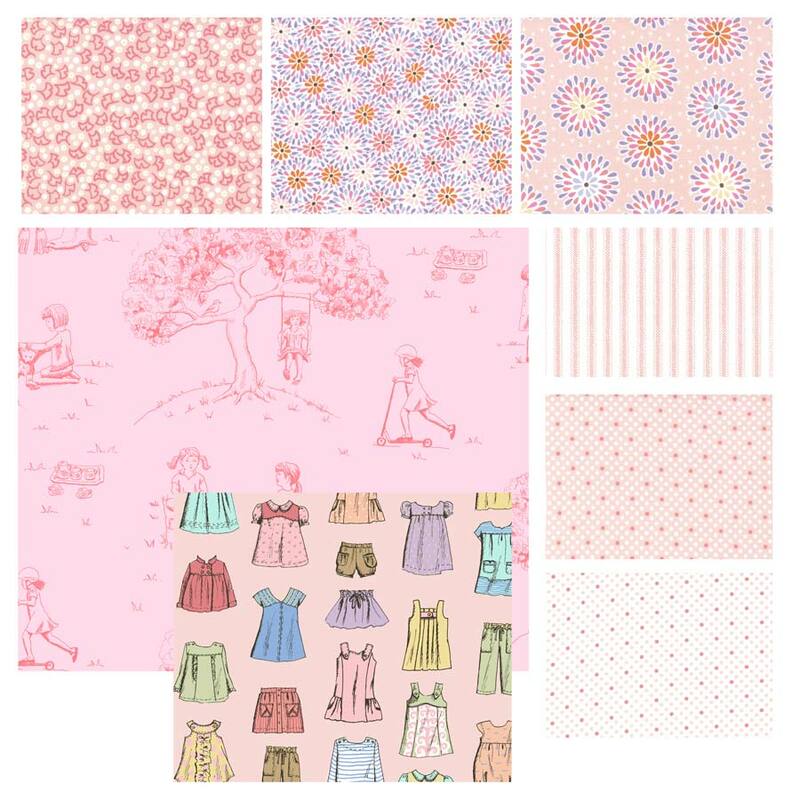 I would love to make the pink dress with Indian Summer fabric. Can you tell me if you sell the pattern or where to get both the pattern and the fabric? Thank you for the pattern information. Do you have locations where the pink toile fabric could be purchased? Dee Ann, I don’t know that you will be able to find the fabric anymore. That was a collection produced several years ago, and it hasn’t been in stores for quite some time. You might find it with some creative searching on eBay or Etsy, but I doubt that retailers will still have it in stock. Sorry I can’t have better news for you. Thank you for letting me know, Todd. I will look for a substitution.